This page only gives brief details of the above titled book, now out of print and no longer available for sale at our museum. But, all is not lost, it is available to view online, by the excellent work of our good friends at HullWebs, on the link below. It was Len's drive and dedication that led to so much history about the RAF's time here being revealed for all. 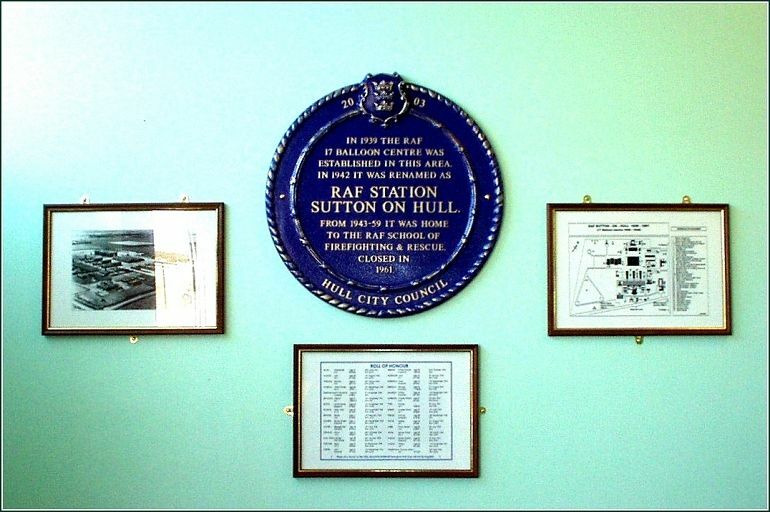 It was his insistance that the contribution to the defence of Hull of former colleagues who served with him in Sutton during World War Two should not be forgotten that also led to the placing of the Blue Plaque in Bransholme Library. Indeed, it was sales of the book that helped to fund the purchase and placement of the plaque. Additionally, as well as the book and the plaque, it was Len's help and enthusiasm that enabled us to post these pages about the RAF station here, and also the excellent history that appears on the HullWebs site. Len derived much satisfaction at having completed the task he set out to do. There were times when it seemed as if his health would not allow it, but he drove himself on. So it is was with great sadness when we reported Len's sudden death, at home, back in August of 2007. Len was a familiar figure at the Museum on Fridays, helping all who asked his advice or who sought information about the RAF station and it's history. To say he has been sadly missed is rather an obvious understatement. Whatever he did, the book, the campaign for the plaque, he made sure it was a job well done. There is now an excellent Website devoted entirely to RAF Sutton on Hull and the Balloon Squadron stationed there. It contains photos, station plan and a full history by Leonard Bacon. 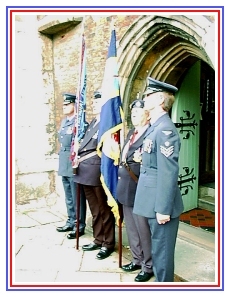 Saturday, 18 October 2003 saw a service at St James to commemorate the 60 years since the formation of the RAF School of Fire-Fighting and Rescue back in 1943. 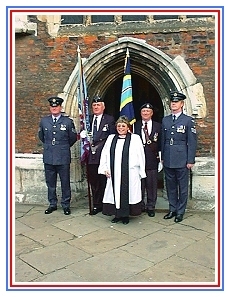 The RAF & Defence Fire Service Association Standard was dedicated by the Reverand Heather Nesbitt in a service that was attended by some 200 retired RAF personnel from all over the UK who did their training at RAF Sutton on Hull during the 16 years the School was in existance. 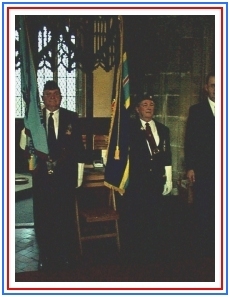 The second standard on display was that of the Royal Air Force Association (RAFA). The Lord Mayor of Hull, Councillor Kenneth Branson, and his lady, attended the service, as did two serving NCOs from today's RAF. Please forgive my poor quality photos .. I'll replace them with better ones if someone can email me some. It was a lovely service .. though I can't help the thought that composer, Eric Coates, may have had a wry smile at the choice of the tune to go with the first hymn . . . had he been able to hear it. Sutton, St James', and The Ship Inn, home to the memories of many an airman who trained here, and those who manned and maintained the wartime balloon defences. Sutton on Hull station ... a different station. This is how many an airman arrived to take up his new posting in this far-flung outpost of the British Empire. If Hull was termed as being at the end of the earth ... heaven only knows how all those men regarded Sutton. I could just imagine them getting their posting chit ... " Sutton ... Sutton on where ? Where in heaven's name is that ?" And that's the polite version ! But I've no doubt local Sutton folk made them welcome ... 60 years later, some 200 wanted to come back and remember their time here. On Wednesday, the 24th of September, 2003, Local Historian Len Bacon presented this Hull City Council plaque to Councillor Gemmell for display on the wall of Bransholme Library. It commemorates that in the area, there was in existence from 1939 to 1961, a Royal Air Force Station. Originally designated as RAF 17 Balloon Centre, it was opened on Wednesday 28th June 1939, and from there during World War 2, the Balloon Barrage in the defence of Kingston upon Hull and the Humber Area was controlled and maintained. 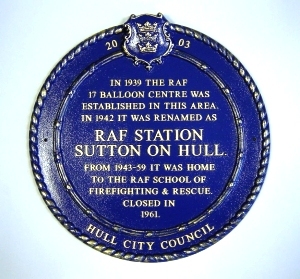 By September 1942, over 2,000 Royal Air Force and Women's Auxiliary Air Force personnel served at and from the Centre, which on the 15th October 1942 was renamed to become RAF Station Sutton-on-Hull. Also there was the home of the RAF School of Fire Fighting and Rescue from 1943 - 59. The RAF Station was finally disposed of on Monday 14th August 1961. Covering 83 acres, the land was developed for the Bransholme (North Point) Shopping Centre, housing, and located centrally, the Bransholme Library which now displays this splendid commemoration. The plaque has been sponsored from the proceeds of the sale of Len Bacon's book "Hull's Own Air Force Station", still available from Len at the Resource Centre in the Old School on Fridays, or the at Balloon Barrage Reunion Club, or of course, you can email Merrill or myself for further details. We'll be happy to help. We understand that there are not all that many copies left. This Hull City Council plaque is the first outside the City Centre, the first marking of a World War 2 defence installation, and definitely the first on Bransholme Estate ! 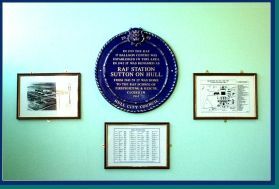 The plaque is flanked by a Roll of Honour of the names of personnel who died whilst serving at RAF Sutton on Hull in the course of their duties, an aerial photo of the station, and a plan of the whole site. Click for a full page image. on our Other Links Page or click the button in the menu. For another RAF link of interest to our area, there is a Battle of Britain pilot buried in Sutton churchyard. F/Lt Pat Hughes is credited with shooting down Luftwaffe ace, Franz von Werra, the famous German escapee who became renowned for his escaping prowess. and have locked yourself out. and the Balloon Squadron stationed there. It contains photos, station plan and a full history by Leonard Bacon. ... was the top-secret underground Cold War Bunker, built in 1951-52 as part of the UK's radar defence shield. 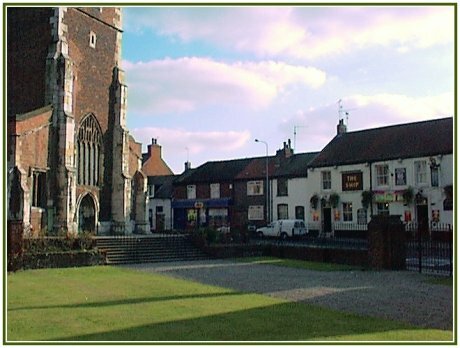 It re-opens to the public from 17 Feb 2007, with guided tours. and up to the time when RAF Sutton was the premier fire-fighting training school for the RAF..
around 1945, perhaps when he first came here. All work completed, and a very empty 'out' box. The high-tech comms system is worthy of note here. WO Pascoe was officially credited as being heavily involved in the designing of early asbestos fire-fighting protection suits. He is seen here, around 1960, in this excellent photo riding the running board of one of the station fire trucks along with his training team. The other man perched precariously to his left is holding one of the newly designed suits. ~ ~ ~ Amongst other photos Stephen sent us were these of happy times. 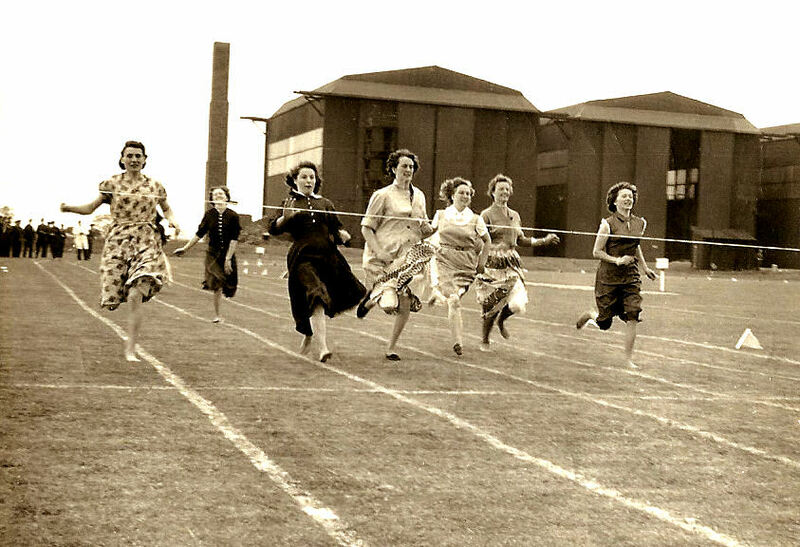 Firstly, left, a camp sports day in 1956, with his mother, Lou, far left. 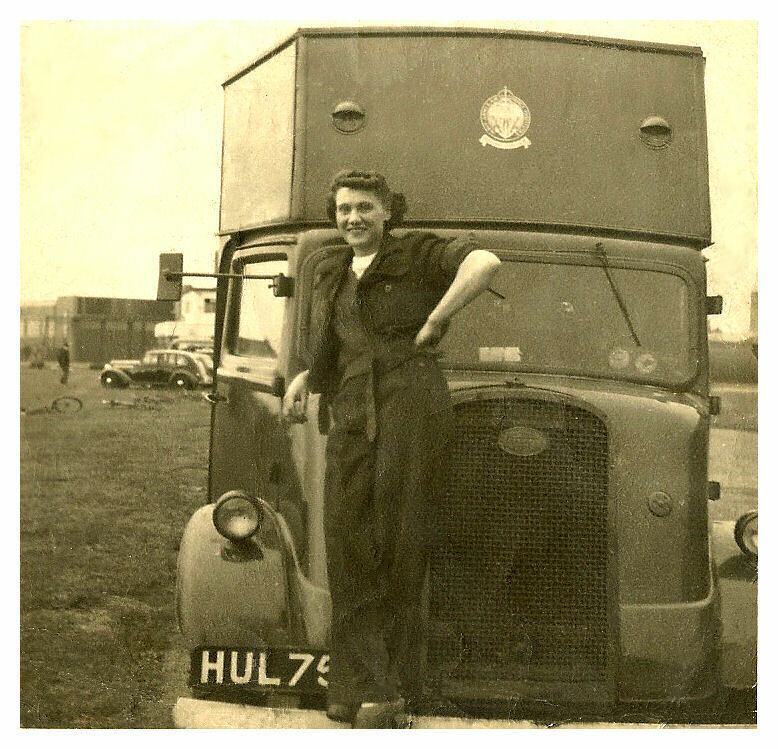 And right, here earlier in the 50s with the NAAFI van she drove. 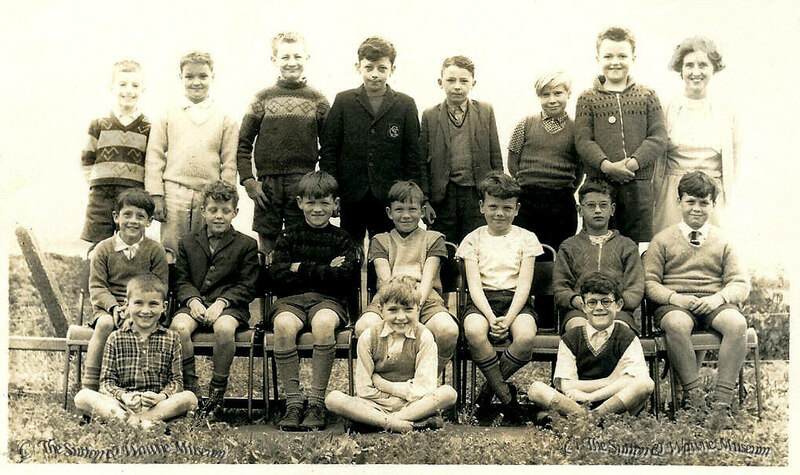 Finally, we have a class photo of the early 60s, exact date unsure. Stephen attended St James', as did his brother Colin, before the family decamped to live in Cornwall, where Stephen lives now. I'm sure some of the other pupils here were also children of other RAF personnel at the camp, so from Sutton Gardens, those being the married quarters. Though Stephen lived with his family at 'Eastfield', a farmhouse just up Wawne Rd nearly opposite Lambwath Hall, and which adjoined the larger 'Westfield' and both premises backing onto the RAF camp itself. Stephen also provided us with a bit of history of the residents of Eastfield and other locals he recalls. 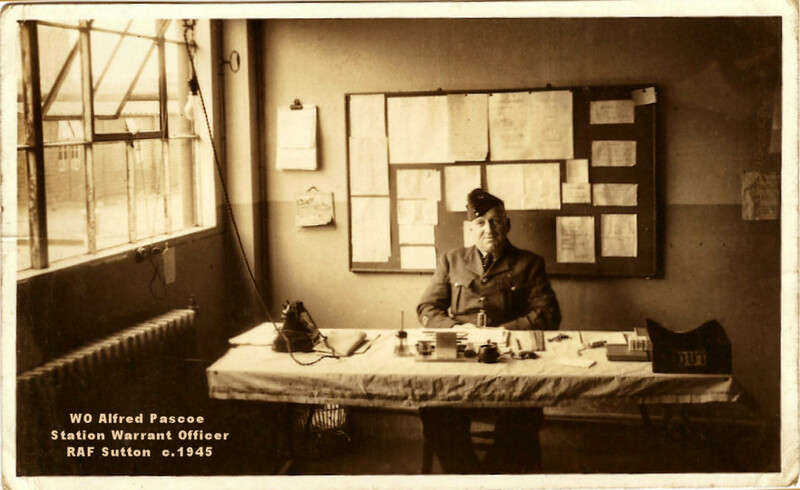 "After retirement from the RAF, Grandfather Fred Pascoe lived there, with his wife May, youngest daughter Valerie (a pupil of Sutton School) and eldest son Arnold, who was the NAAFI Storeman on the camp after his war service in Europe with the 4th Dorsets. He ran the farm buildings and land of 1 acre as a smallholding, concentrating on poultry and pigs with a small market garden. Fred Pascoe moved to Cornwall in 1954 at which point his son, Arnold took over the smallholding. 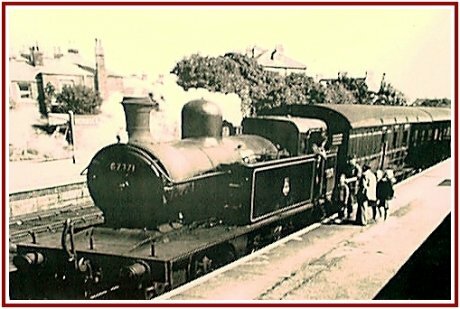 Arnold, newly married to Lou lived there, with in due course their sons Stephen and Colin, both in turn pupils of Sutton School, until they all moved to Cornwall in 1965. Not long afterwards I believe that the Bransholme development started. During the period in question the house next door, 'Westfield', was occupied by farm workers employed by Mr Stamford Smith; from memory they were in chronological order; Joe Speck, Mr Bayram and Mr Palmer. Note: spelling not guaranteed." and appear here by kind permission of S. Pascoe.